Following all Exchanges in the world, Tunis Stock Exchange organizes the "Ring the Bell for Gender Equality" to celebrate the International Women's Day on March 08 2019. 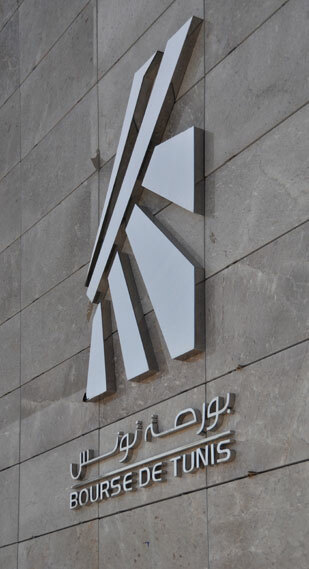 The overall income of the listed companies increased by 12.2% to reach 16.2 billion dinars during the year 2018 compared with 14.5 billion during the year 2017. Company “CARTHAGE CEMENT” will hold a financial communication on Thursday, November 15, 2018 at 10:00 with the Tunis Stock Exchange seat. Company “SERVICOM” will hold a financial communication on Tuesday, 13 November, 2018 at 15:00 with the Tunis Stock Exchange seat. Tunis Stock Exchange organized on November 7, 2018 at its headquarters, a meeting on the "Extra-Financial Reporting on CSR: a voluntary strategy or an obligation? ", intended for listed companies, brokerage firms and other financial ecosystem actors. Company “GIF FILTER” will hold a financial communication on Thursday, October 11, 2018 at 15:00 with the Tunis Stock Exchange lac 2, Tunis. 28/09/2018Start of negotiations on the title "TUNISIE VALUES"
The Tunis Stock Exchange hosts today on its main market, the company TUNISIE VALUES, the first broker to be listed. Company “SAH” will hold a financial communication on Tuesday, October 2, 2018 at 15:00 with the Tunis Stock Exchange lac 2, Tunis.